The xCraft offering is now closed and is no longer accepting investments. Once the stuff of science fiction, drones are now a part of our day-to-day lives. These unmanned aerial vehicles have changed so many things and provide an exciting way for people to explore and interact with the world around them. Drones can be so much more than just a recreational pastime, though. If put to good use, they have the power to affect real and lasting positive change in the world. At xCraft, we recognize this potential, which is why we’ve worked tirelessly to make our technology the gold standard in this still-nascent industry. In only a few short years, our flagship product, the X PlusOne, has garnered widespread acclaim for its precision, speed and maneuverability. Soon to be released, our PhoneDrone Ethos, which can convert a smartphone into a flying vehicle, will give more people than ever before access to this exciting technology. But, that’s just the start. We fully believe that our technology can be used to help first responders at the scene of an accident, it can help corporations and governments achieve security at their most vulnerable points, it can help scientists to learn more about our world and to find ways of preserving it, and it can assist greatly with search-and-rescue operations following an environmental catastrophe. In short, we believe that it can change the world. This is our vision; it’s a grand one... And that’s why we’re turning to you. Crowdfunding is something that’s woven into the very DNA of xCraft. Since the beginning, we have fueled our innovation by reaching out directly to the public through platforms like Kickstarter and Indiegogo. But, now we’re doing something different. Instead of offering a bit of swag or a prototype in exchange for your financial contribution, we’re offering you an opportunity to invest in the future. Drone technology has come so far, and it has yet more places to go. With your investment, xCraft can realize the full potential of this exciting technology, a potential that encompasses many industries, from agriculture to transportation and everything in between. Invest in xCraft today. Be a part of the future, and help us to bring positive change the world. $1.70/share│When you invest you are betting the company’s future value will exceed $6.0M. All Kickstarter and Indiegogo backers who invest will receive a complimentary 20% off any one purchase from our website. Any Phone Drone Ethos or Rogue product received will be shipped when they are ready for market. Consumer drones and autonomous aerial vehicles have great potential. With your investment and our technology and ingenuity, xCraft aims to change the world. To say that it’s been a wild ride for xCraft would be putting it mildly. Co-founders JD Claridge and Charles Manning met only three years ago, and in that short time they have managed to build a powerful drone company. This incredible success was not achieved through their work and that of the team alone. It’s due, in no small part, to the thousands of individual contributors who helped to fund xCraft’s flagship product, the X PlusOne, through Kickstarter. 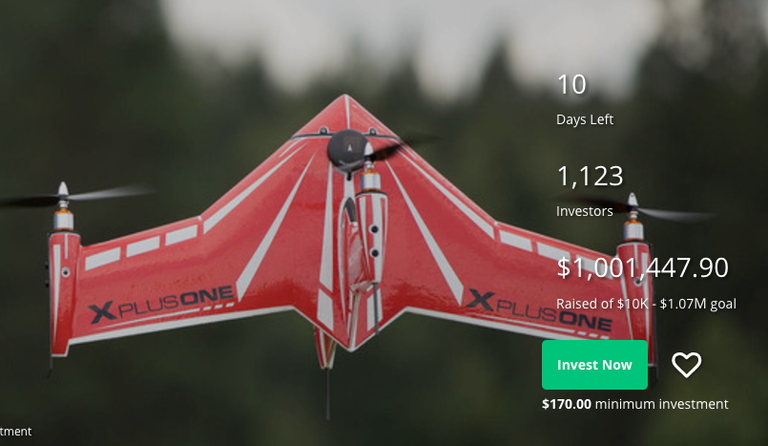 That initial crowdfunding campaign managed to triple its goal, and allowed xCraft to make the X PlusOne one of the most powerful and unique consumer drones in the marketplace. But the vision was never just one powerful drone. The vision was to use drone technology to transform the world, and realizing that vision began with finding a way to get drone technology into more people&apos;s hands. And so, the PhoneDrone Ethos was born. It&apos;s this track record of success and xCraft&apos;s future potential that led to one of the company&apos;s most high-profile successes yet. Appearing on ABC&apos;s Shark Tank, JD and Charles were able to bring all five sharks in on a deal worth $1.5 million! When you invest in xCraft, you will be making the same decision that business icons like Mark Cuban and Kevin O&apos;Leary did. A hit with consumers already, xCraft&apos;s technology is poised to blaze new trails in a myriad of industries. Over $143,000 raised for the X PlusOne on Kickstarter. Over $325,000 raised for the PhoneDrone Ethos on Kickstarter. 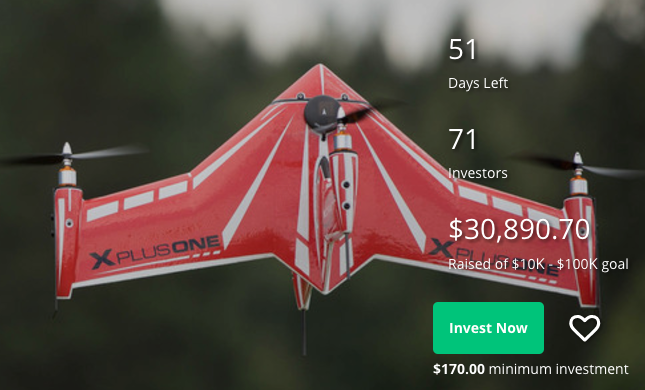 Over $64,000 raised for the PhoneDrone Ethos on Indiegogo. xCraft technology is being licensed for uses outside of the consumer market. As xCraft&apos;s flagship product, the X PlusOne has a host of killer features that have made it a darling among drone enthusiasts. It&apos;s perhaps best known for being the ultimate hybrid, capable of hovering one moment and zooming at speeds approaching 100 kph the next. But that&apos;s just the tip of the iceberg. These features combined with our precision engineering are proof of the trailblazing technology that fuels xCraft&apos;s capacity for innovation. We believe that as many people as possible should have access to drone technology. That&apos;s where the PhoneDrone Ethos comes in. This unique device leverages the procession power and telemetry equipment of a smartphone and combines it with our expertly engineered drone hardware. The result is a powerful drone for nearly half the price that consumers have come to expect. This powerful, smartphone-enabled technology is poised to change the consumer drone market forever. We can&apos;t wait for you to see it in action this Spring! We’re incredibly proud of the X PlusOne and excited to witness the various applications people will have for the PhoneDrone Ethos. But, these two products are only the beginning for xCraft. Ultimately, the future of drones, and particularly autonomous aerial vehicles, lies outside of the consumer realm. When you invest in xCraft, you&apos;re helping to bring a diverse array of applications for drone technology to the fore. In a world that&apos;s constantly growing and that is beset by environmental disasters, a more efficient and bountiful agricultural industry is of paramount importance. Drones can help farmers all over the world to maximize their yields and to develop new ways of planting and harvesting in a sustainable manner. The first minutes after an environmental catastrophe or another calamity are critical. First responders, though, can only respond to what they&apos;re able to see. Drones can put eyes and ears in the sky, helping these first responders to offer superior assistance to those who are in the most dire need. With roadways becoming more and more backed up every day, it&apos;s readily apparent that new solutions to congestion are needed. It&apos;s xCraft&apos;s belief that autonomous aerial vehicles can be used to provide a new means of transportation, alleviating grid-lock traffic in the world&apos;s most populous cities. Even better, they can help to curb the pollution that threatens our world. As the world becomes more technologically advanced, the nature and scope of security threats only continue to expand. Drone technology can be leveraged by private individuals, businesses, institutions and governments in order to provide tighter and more efficient security in an increasingly dangerous world. These are just some of the myriad ways in which xCraft&apos;s drone technology can be deployed to change the ways in which various industries and services go about their businesses. Our state-of-the-art technology can be utilized by people in fields as diverse as energy, insurance, environmental science and even in the exploration of other worlds. Because of all of this, xCraft is uniquely positioned to affect positive change in the world. "You guys are going to own this market." - Kevin O&apos;Leary AKA "Mr. 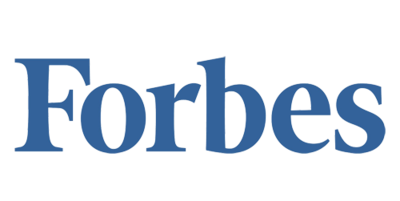 Wonderful"
Speaking to JD and Charles on "Shark Tank"
When examining the present and future of the drone market recently, Goldman Sachs reached some noteworthy findings. Namely, the commercial market for drones is expected to grow to $20.6 billion globally within the next five years. This will outpace that already accelerating market for consumer drones, which is still in its infancy. According to the same study by Goldman Sachs, the consumer drone market could be valued at $14.5 billion globally within five years and $3.6 billion within the U.S. alone. While we will continue to manufacture and sell state-of-the-art consumer drones, the commercial market is what really excites us at xCraft. Drones have applications across a variety of different industries, and our technology and software is uniquely poised to capitalize upon this. Utility companies can drones them to conduct vital maintenance inspections. Farmers can use drones for crop monitoring. Journalists can use them to gather footage in the most remote areas... "Drones can be game changers in many industries! Not just those you think of right away." The FAA put in place a new drone certification program that had over 3,000 test-takers on the first day. That’s big. Where will all of this go? Higher crop yields, faster natural disaster response, better mining and timber inventory, safer infrastructure operations, faster emergency response, improved security, access to medication in remote areas, same day package delivery... And maybe someday... In the not too distant future... Autonomous aerial personal transportation! JD Claridge and Charles Manning pulled an epic feat in getting offers from all five Sharks. Mark Cuban, Daymond John, Kevin O’Leary, Lori Greiner and Robert Herjavec each bid $300,000 for 5% equity each, significantly increasing xCraft Drone’s original valuation. Claridge and Manning came in asking for $500,000 for 20% equity, valuing their company at $2.5 million. The celebrity investors on Shark Tank have unanimously agreed to invest money into drone maker xCraft. Charles Manning and founder JD Claridge made a successful pitch on the popular ABC television show, raising money for a drone that can take off like a helicopter and move forward like an aircraft. The outcome was revealed on Friday, as the pre-recorded Shark Tank episode aired. In case you missed it, a young aerospace engineer and a veteran software developer taught a master class in entrepreneurship on prime time television last week. The setting was ABC's Shark Tank, a popular reality show built on the premise that there's rich entertainment value in watching would-be entrepreneurs make fools of themselves before a panel of skeptical celebrity investors led by Mark Cuban. * All perks are individual, not inclusive of previous perks. Investors only get one perk reward matching your level of investment. All Kickstarter and Indiegogo backers who invest will receive a complimentary 20% off any one purchase from our web-site. Any Phone Drone Ethos or Rogue product received will be shipped when they are ready for market. The Company does not foresee, nor is there any planned irregular use of any of the proceeds from this offering. We just wanted to let you know we recently sent our latest newsletter to the email we have on file. If you did not receive it, please let us know at support@xcraft.io and we'll get it to you. A Personal Thank You and xCraft Funding Update!!! Thanks to all of you, xCraft has been able to fulfill our maximum funding goal amount of $1.07 million! Your support was so incredible we even oversubscribed, proving to all of us that the demand and impact of what we’re setting out to do is significant. Please know that we at xCraft are grateful for your investment and thrilled to have each of you now as an “owner” of our great Company! Since the end of the campaign, the team at StartEngine has been working tirelessly to sort out the 1,300+ investments. Due to the overwhelming success of our campaign, there have been numerous over-subscriptions, leaving a lot to sort and filter through. This includes their reaching out to investors to complete their investment, waiting for investments to clear, and then refunding those over-subscribed investments. Although nearing a close, this process still continues. Due to compliance and SEC regulations, StartEngine cannot finalize wiring funds raised from the campaign until all the investments have cleared and the over-subscriptions have been refunded. Your investment/ownership will be “evidenced” by way of an “electronically counter-signed subscription agreement” that will be sent back to you from StartEngine. Since the final close of the funding is not yet complete, a few investors have likely not yet received the electronic acknowledgement. If this is you, please notify StartEngine at contact@StartEngine.com and they will take care of you. For those of you that would like an actual stock certificate, you can request one separately by contacting StartEngine and requesting one…they tell me it’s fancy and worth printing! Ongoing ownership records will be kept by the Crowd Manage Services group at StartEngine. Please forward any questions about your investment and/or any changes or updates to your contact information to them for keeping the information current. Please use contact@StartEngine.com as the send-to address. One last thing; a special thank you to those who invested enough to reach one of our “Perk” levels! If that is you, we will be getting in touch with you shortly to arrange details. Please expect an email from xCraft within the next couple weeks to schedule the shipment of your Perk and/or receive your store credit. xCraft is excited to share periodic updates as to the going’s on at the Company. We anticipate sending each of you a quarterly “xCraft Investor Newsletter” to share the exciting things that we are doing! Again, many thanks to each of you for your generous support through this exciting time! We are nearing the finish line of this record-breaking campaign! Only two days left until we must draw xCraft&apos;s crowdfunding campaign to a close. Although we have reached the limit for a Reg CF offering, we are still accepting investments through the end date on July 7th. As previously mentioned, it is likely that some early investors will “fall out”, and anyone who subscribes now will be given preferential treatment to these reassigned initial shares. Great news! We have been able to open up some room for investment in xCraft. This opportunity will likely go fast so if you haven&apos;t invested, please head on over to the campaign and secure yours while there is still time. Please share this update with your friends and family too. xCraft is Still Accepting Investments! Thank you so very much to everyone who has supported our highly successful crowdfunding capital raise! While we have now exceeded the $1,070,000 limit for a Title III capital raise, please feel free to continue to purchase shares and refer others. It is likely that some early investors will “fall out”, and anyone who subscribes now will be given preferential treatment to these reassigned initial shares. If you&apos;ve been watching the campaign, you may have noticed that we just entered the million dollar club! A big thank you to each one of our investors who&apos;ve helped us get here. We are so grateful that you see the vision and are helping xCraft achieve it! If you still haven&apos;t invested, there is still a small window. We are accepting investments until we reach our maximum raise of $1,070,000. It&apos;s been six days since our last update and the campaign has continued to surge! As of 4:40 PM PST today, the total raised is $952,771.80! If you haven&apos;t invested in xCraft yet, there&apos;s still time but the opportunity is closing fast. Don&apos;t let it pass you by! To each of our 1,070 investors who have already made that commitment; Thank you! Your investment will be used to create tremendous long term value in xCraft! Biggest news of the campaign! Huge news we&apos;ve been waiting to share! As you&apos;ve heard, we needed to work through a required financial review in order to raise more than $100,000 through Regulation CF. Well, the financial review is now complete and we&apos;ve raised more, a lot more, than $100,000. As of 6:15 PM PST today, the campaign total is $716,434! We are on track to raise the $1,070,000 maximum under regulation CF! We have seen a huge uptick in momentum since we hit the $100,000 mark, and honestly, we have to give our investors the credit! You have obviously been doing your job spreading the word about xCraft. Thank you! We plan to extend the campaign another two weeks to allow a little more time to hit our stretch goal of $1,070,000. With your support, we can do it! Please forward this update to your friends and family to help us reach that goal. If you haven&apos;t invested yet, there is still a little more time to do so. We absolutely have to cap the campaign at the $1,070,000 mark per SEC requirements. After we hit that limit, we won&apos;t be able to accept any additional investors. The way things are going, that could be very soon! For those of you who have come in and invested after we reached $100,000, please see the below instructions on how to reconfirm your investment in xCraft. Each investor who needs to reconfirm their investment will receive an email shortly from StartEngine with a secure link allowing investors to re-confirm their investment. Once you click the link and are logged into StartEngine, you simply need to enter your name, the company, and click the “Sign” button at the very bottom of the webpage. If you do not receive an email, your investment is all set and you do not need to reconfirm your investment. If you have any questions about the process or any trouble reconfirming your investment, please reach out to contact@startengine.com or call 800-317-2200 between the hours of 9:00am - 5:00pmMonday through Friday PST. Thank you for your support and helping to make our dream come true! We are blown away by the response in the last week! To each of our 408 Investors; thank you so much! Some of you have been asking so just a reminder that we are still accepting investments until the campaign end date of June 23. We&apos;re working on a financial review as quickly as possible so we can display the actual total of our investment instead of just $99K+. We&apos;re excited to show you! If you&apos;ve been considering investing, now would be a great time! Please share this update with your friends and family to spread the word! Wow, that went fast! We weren&apos;t expecting to hit our $100k goal in just 3 days but it happened. Thank you to everyone who got us here! The good news is that it isn&apos;t over. We are still accepting investments while completing a financial review (per SEC requirements when raising over $100K). The displayed amount will continue to read $99k+ until the review is done. Please share this campaign with your family & friends. We&apos;d love to see them on the investor list too! xCraft has exceeded their minimum funding goal and are continuing to accept investments through 6/23/2017. Per their offering terms, and because their equity crowdfunding campaign has now exceeded the minimum funding goal by over 787%, they have decided to conduct a closing on 6/9/2017. If your funds have cleared you will have up until 48 hours prior to this closing to cancel your investment. If your funds have not yet cleared by this date, then you will be part of the next closing if and when your funds do clear. Big Gains and New Video! It&apos;s been a little while since we posted an update but wow, a lot has been happening! With only 21 days left, we are over $80K and dangerously close to our $100K max goal! The campaign has increased almost $20k in just the last three days alone! A special thank you to all our new investors for making this happen! We always like to share something special with our investors. Here is a flight video of the x2 Geo flying in beautiful Aarau, Switzerland. Enjoy! If you haven&apos;t invested yet, don&apos;t let this opportunity pass you by. Get in now, before we hit our max goal of $100k! We&apos;ve crossed the $50k threshold and we&apos;re on our way to $60k. So good to see our investor list steadily growing! Let&apos;s keep up the good work and spread the news about xCraft. Please share this update with your friends and family! We&apos;re approaching the $50K mark! 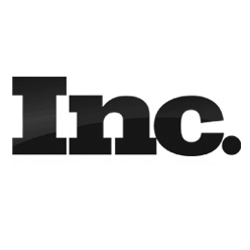 Thank you to 101 amazing investors! If you haven&apos;t invested yet, we&apos;d love to have you join the ranks! Just an update from the XPonential show in Dallas. We&apos;ve had lots of interest in xCraft. The booth has been a non-stop busy with people checking out our new product. As promised, we released a brand new commercial drone called the x2 Geo. It is the first hybrid VTOL mapping drone. The x2 Geo allows operation from virtually anywhere to capture high-resolution aerial imagery. It&apos;s a game-changer for surveying, mapping, and agricultural markets. Also, I had the honor of speaking at the Startup Showdown last night. If you weren&apos;t able to see it live, you can check it out on our Facebook page. Thank you all for being part of this journey! The last few days have been huge! Almost $10,000 raised in just 5 days! You are obviously doing your part to bring xCraft to the next level. Thank you! Today, we are off to Dallas for the XPonental show! It&apos;s one of the biggest UAV and autonomous vehicle shows in the world. We&apos;ll be making some big announcements there! If you happen to be attending, stop by booth #345 and say hi! We would love to meet our investors in person. Per their offering terms, and because their equity crowdfunding campaign has now exceeded the minimum funding goal by over 232%, they have decided to conduct a closing on 5/12/2017. If your funds have cleared you will have up until 48 hours prior to this closing to cancel your investment. If your funds have not yet cleared by this date, then you will be part of the next closing if and when your funds do clear. Today we broke the $30,000 mark! Tripling our goal in only 3 weeks. What a ride! 71 investors have gotten on board to make this dream a reality and are now proud owners of xCraft stock. We are so thankful to each and every one of you. This isn&apos;t just about us. We know it requires a stellar team to accomplish anything great! You are playing your part and we love watching it happen. Even if you haven&apos;t invested, you can still play a huge role. Share this update and we&apos;ll take it to the next level together! Wow! Thank you so much for allowing us to reach our $10,000 goal so quickly! We&apos;re now at 219% and climbing. It is so cool to read through all the names of our new investors! We are honored and humbled to see such support. We can&apos;t thank you enough! We also wanted to let you in on a little secret: We will be releasing TWO new drones at the AUVSI Xponential Show in two weeks! Be on the lookout for these game-changing products to hit the market! ps: Let&apos;s keep up the momentum. Please share this update with your friends so they too can invest in xCraft!